Over the last couple of weeks (late May – early June 2017) I have given a series of talks based on my writing of Sevastopol’s Wars: Crimea from Potemkin to Putin. This round-up records the highlights. — Why Crimea generally and Sevastopol specifically have been so important to Russia (and the Soviet Union) since 1783, and why it was re-annexed in 2014. What does this act tell us about the enduring importance of geopolitics, military strategy and power projection? — The source of the deep and significant attachments of Crimea to the Russian people today – examining the close relationship between the inhabitants of the peninsula, including Sevastopol, and the Russian Federation; and understanding why the Russian action in 2014 was widely welcomed there. I am very grateful to the Institute’s Director, Chris Donnelly, for inviting me, and to Stephen Dalziel for chairing the session, where I suspect I learned as much as anyone else present! The Author with Professor William Philpott, War Studies Department, King’s College London, 1 June 2017. 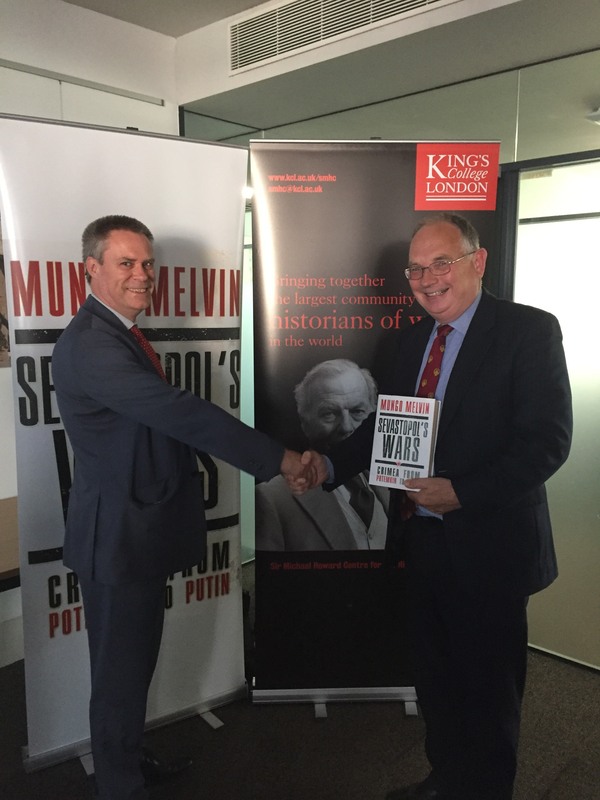 On Thursday, 1 June, I gave a talk at the Sir Michael Howard Centre for the History of War at King’s College London. My presentation was titled ‘Writing and Researching Sevastopol’s Wars’. Although perhaps not as well attended as the organisers and I might have hoped (always challenging during a summer term), we had nonetheless a very productive discussion. I was particularly pleased that Professor Andrew Lambert attended the session because I had made considerable use of his seminal work, The Crimean War: British Grand Strategy against Russia 1853-56 (2nd edition, 2011) in my research on Sevastopol’s Wars. Unsurprisingly, Professor Lambert asked a number of thought-provoking and pertinent questions. I would like to thank Maggie Scull for organising the event and to Bill Philpott, professor of the history of war, for introducing me and chairing the question and answer period. 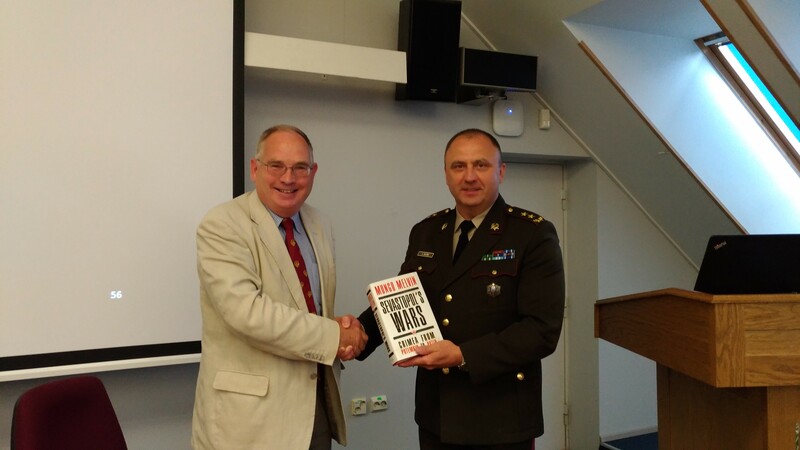 The Author with Major General Andis Dilāns, Commandant of the Baltic Defence College, 5 June 2017. At the beginning of this week (Monday, 5 – Tuesday, 6 June), I undertook a short lecture tour in the Baltic States. My first lecture was at the Baltic Defence College at Tartu, Estonia (where I have lectured on a number of occasions over the last few years). My subject on 5 June was ‘the Russian Annexation of Crimea in 2014 and Hybrid Warfare’ – a somewhat controversial topic. As I make clear in my book, for many Russian-speaking and -leaning members of the Crimean population the outcome represented a welcome reunification with their mother country. Others, however, including many from the Tatar community, were happy to remain under Ukrainian rule. We had a interesting discussion period concerning this matter and many other points. I am grateful to the Commandant of the College, Major General Andis Dilāns, for inviting me; to the Dean, Colonel (ret’d) Dr. Zdzislaw Sliwa, for organising the visit in concert with colleagues of the National Defence Academy of Latvia; and to Colonel Mark Hollis U.S. Army for hosting me. 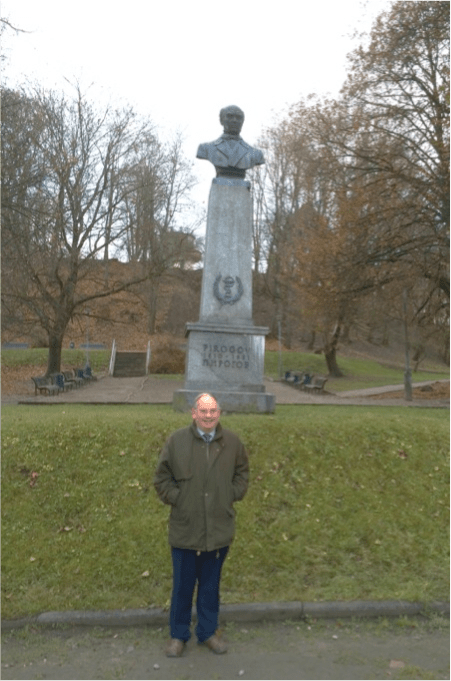 The Author standing in front of the monument to Professor Nikolay Pirogov, Tartu city centre. In Eastern Europe and in the states of the former Soviet Union, Pirogov is remembered, honoured and treasured. Without exaggeration, both civilian and military medicine today owe much to his pioneering methods. First, he was an early advocate of preventative medicine and cleanliness. He organised voluntary female nurses to take care of the injured; he introduced a series of fundamental practices, including anaesthesia (using both ether and chloroform) to military surgery and the use of plaster to stabilise and set fractures. He streamlined operating procedures by teams of surgeons working together; and established a system of triage to prioritise and regulate the treatment of the wounded whether at the dressing station, field or base hospital. In many respects he was well ahead of his time. The Author with Lieutenant Colonel Valts Āboliņš, National Defence Academy of Latvia, 6 June 2017. The second leg of my brief tour took me to Riga and the home of the National Defence Academy of Latvia. This was my first visit to Latvia and its fine capital city. On 6 June I gave a lightly refreshed version of the talk I had given in Tartu the day before to a somewhat larger audience of students and members of the academy faculty, including Dr. Jānis Bērziņš, director of the Academy’s Centre for Security and Strategic Research, whose research work on Russia I quoted in my talk. Again we had a lively discussion period. Many questions concerned the character of hybrid warfare and the implications for defence forces today. I am particularly grateful to Colonel Georgs Kerlins, the Commandant, to Lieutenant Colonel Valts Āboliņš, and to Jānis Bērziņš for their kind hosting and strong engagement. — The evolution of Hybrid Warfare cannot be divorced from wider diplomatic, information, military, economic and social developments. — Aspects of Hybrid Warfare are as old as the hills, and have formed an enduring element of Russian/Soviet military thinking and practice. — The theory and conduct of Hybrid Warfare will continue to evolve, and typically ambiguously. 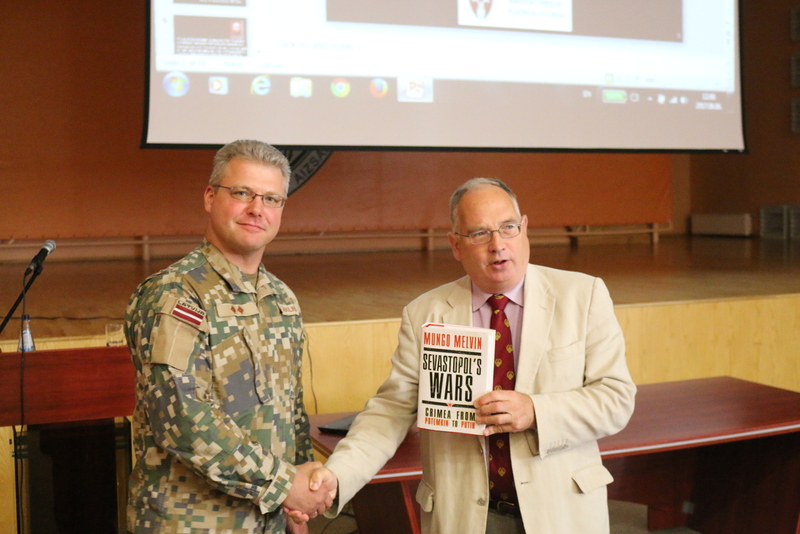 In Tartu and Riga I presented copies of Sevastopol’s Wars to my hosts – and trust that the students and staff in both educational institutions will find my work of interest. In the meantime, I remain convinced that strategy and statecraft today can be informed and shaped by history. Not that any historical event can be precisely replicated, as each situation is unique, but certain episodes down the centuries (particularly in the case of Crimea and Sevastopol) appear to show a pattern, if not chime. Those who wish to learn more about Crimea and Sevastopol from the founding of the Russian naval city in 1783 to the dramatic events of 2014 may wish to order a copy of Sevastopol’s Wars using the following link.